Robin van Persie has caught the attention of the media, and the rest of the world. They’re all for the right reasons. He sits on 34 goals for the year 2011 and close to beating Alan Shearer’s record of scoring the most goals in a calendar year. This would be an impressive feat in any league, but even more so in the Premier League because of the gritty and compact defenses that it possesses. The timing of his incredible form in front of goal could not have been better. The club was looming with disappointment with the loss of stars Cesc Fabregas and Samir Nasri. Someone needed to step up to the plate and inspire hope into the side. 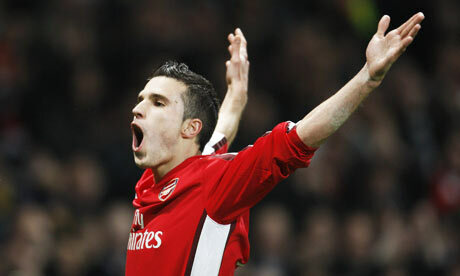 RVP took the mantle of captaincy with glee and led from the front. This season we witness the Van Persie that we missed in previous seasons, when he found himself injured in the sidelines on a regular basis. The past is past, and Wenger still had confidence in his ability as he became the Arsenal frontline striker. While a couple of years ago he used to produce flashes of brilliance with his dribbling and powerful free kicks. 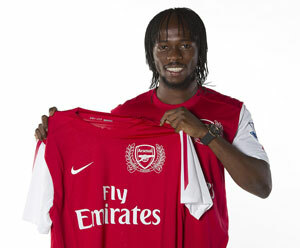 Now he is able to singlehandedly produce a string of classy, consistent performances which reap positive results. Even though the side heavily relies on his performance day in and out, he handles the pressure incredibly well and thrives in it. Transfer rumours will always surround a player of his quality. 3 years ago it was Juventus, and now it is Real Madrid and Manchester City who are anticipating his signature. It is difficult to gage the future but it is unlikely that Dutchman will leave the club so soon. He should realize his enormous responsibility and importance to the club, something he would not get in parity with clubs filled with big names. Either way, Arsenal fans can just hope that he pens a new contract with the club as soon as possible and continues to mesmerize us with his match winning contributions. He loves the club, and he loves his role as captain. This was evident when he scored the wonder volley goal against Everton (see video below). Instead of doing a solo celebration for his magical personal effort, he ran over to the Arsenal bench to celebrate the crucial 3 points earned for his side. Salute to you, Captain Van-tabulous. Arsenal has been looking for a solid defender ever since the start of the transfer market this season. Yes, we signed Carl Jenkinson but he’s just one for the future. Firstly we were close to signing Phil Jones, but he just chose to join Manchester United instead. Considering Manchester United’s recent successes, no one can blame him. Then there was Christopher Samba, who was misquoted by The Sun that he expressed an interest to join Arsenal. He came back and quashed it furiously. He might as well be leaving Blackburn, but his price tag may just a bit too much for what he’s worth to Arsenal. The first bid of 10m was turned down by Everton for Jagielka. He seems to be the most likely defender to join Arsenal as rumour has it that Wenger will re-bid for 15m. That would be an interesting dilemma for Moyes, and only patience will dictate this transfer. What about Scott Dann? Arsenal has been linked with him for a while now. He was close to a switch to Stoke but it didn’t materialize in the last minute. From then on the likes of Chelsea, Tottenham and Liverpool have also joined the race. I know Birmingham was relegated last season, but they have always been a gritty defensive team. All the Premier League clubs last season found it hard to break the Birmigham defense, especially in St Andrews. The reason for that is both Roger Johnson and Scott Dann were rock solid in defense. One thing is encouraging is that Wenger is only showing interest in Premier League defenders, those who have been performing consistently and are physically capable of handling the pressure week in and out. He’s not going to risk it with an overseas signing this time around. If a 10m bid is enough to secure Scott Dann, then Wenger should put in some serious thought to getting the 24 year old centre-back to Arsenal. Let’s face it, time is running out and teams will be more and more hesitant to get rid of their first choice defenders as it’ll be even harder to replace them. Dann would be a strong back-up to both Vermaelen and Koscielny. He would also probably provide stiff competition to Squillaci for a run in the first team! This has hardly been one of our best pre-seasons in recent years. Whether you accept it or not, there is a very pessimistic vibe around the club now-a-days. Anxiety mixed with tension from practically throwing away our title hopes last season still remains. The lack of signings so far, especially in the defensive department, is not helping at all. On top of that, we just lost a trophy in our own tournament which featured far weaker teams than previous pre-seasons. Of course, the boos were unnecessary and uncalled for. It’s just another pre-season game, after all. The whole point of the matches was to improve fitness levels, try out different formations and experiment with different combinations of players. 1) Szczesny, Djourou and even Wenger himself have been saying how they have been practicing to avoid conceding silly goals. But, in none of the pre-season games did this show. All we saw was the same shaky Arsenal defense giving away comfortable leads and conceding at the most awkward times. At the moment, it looks like the ‘one defender’ Wenger promised may not be enough. 2) Arsenal has been poor in most of the pre-season games so far. Yet after each match, Wenger would come out and praise the team as if it was all fine and well. He even managed to squeeze in some ridiculous comments such as ‘we managed to play well for 60 minutes’. Sometimes I feel Wenger intentionally tries to anger the fans! I just hope he acts differently in the dressing room. 3) According to Wenger, this is supposed to be our ‘most important transfer window’ in a long time. Yet, so far, there is hardly anything that’s been done in the transfer market to A) strengthen our defence and B) replace players who have or are yet to leave. So, losing the Emirates Cup was pretty disappointing and some fans certainly overreacted to the situation. But there are some delusional fans that have hardly reacted. I remember reading some of the post-match tweets saying stuff like ‘Glad that we didn’t win the Emirates Cup, now the players will want to win the PL title even more’. I’m sorry, it’s one thing to be spiritual but that’s just absurd. How can anyone justify losing/drawing in any game, regardless of its triviality, as being positive? Some fans went on to say things like ‘I’m glad we are playing this bad, at least this will help Wenger realize how weak the team is!’ If you ask me, losing a pre-season game is hardly something which will bring Arsene to realize the problems within the team. If throwing away 4-0 leads and making ludicrous defensive errors in actual competitive cup matches did not bring Wenger to reality, a mere pre-season friendly surely wouldn’t! In any case, all this pessimism brought me to think about the Cesc and Nasri situation. Both are apparent want-aways but both have different reasons to leave. Cesc wants to leave the club to play for his boyhood club Barcelona. In fact he wanted to leave for quite some time now. Reportedly, Fabregas was ready to leave Arsenal last year but cunning Arsene convinced him otherwise. Arsene bought Fabregas for one more year saying that Arsenal would win trophies the following season. Cesc was already frustrated with the lack of trophies after serving for Arsenal since he was sixteen, but he couldn’t say ‘no’ to the man who made his career. So that was that, one more year for Cesc. But as we all know, the trophies never arrived and things are now more unstable than ever in the Cesc transfer saga. The Nasri situation is quite different. Although it’s clear Nasri is reluctant to sign a new contract, the reason for not signing is still obscure. Some say that Nasri is a typical sports mercenary and is holding up for a big-wage contract offer while others say he would not commit to a club who are not winning trophies and furthermore doing hardly anything to change that. Surely the current way Arsenal are playing is not helping either of the situations. The same old problems shroud the team and this seems to be clear to all but Wenger. In the last game, Nasri seemed to be in all sorts of disarray. His mind never seemed to be in the game. Cesc reportedly left the match during half time. The fans losing hope in the team is one thing, but when players themselves lose hope, it’s something completely different.